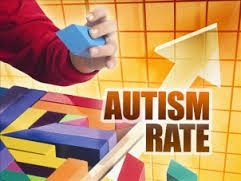 Today the CDC released the latest autism prevalence statistics. According to the Centers for Disease Control (CDC), autism now affects 1 in 68 of American children—an increase of 30% from two years ago. The 1 in 68 statistic comes from children born in 2002 who were 8 years of age in 2010 when they were counted at one of 11 Autism and Developmental Disabilities Monitoring (ADDM) Network Centers across the United States using health and special education records. Prevalence varied from 1 in 175 in Alabama to 1 in 45 in New Jersey. These 11 communities are said to be comprised of 9% of the US population of 8 year-olds in 2010—who, by the way, are now 12 years old. What about the kids who are 11 and younger? That they aren’t counted in these statistics which have been sharply increasing every year, tells me the actual numbers are much higher—probably approaching the 1 in 38 figure that was derived in a total population study conducted in South Korea in 2011 by Yale researchers. How wonderful that the CDC is at the forefront of “documenting” this unmitigated catastrophe that their own numbers say affects 1 in 42 American boys. Dr. Boyle’s emphasis seems to be on getting services to the children affected with this blight rather than serious research into the causes of autism--causes that might involve a closer look at the vaccine schedule and existing research that shows vaccines can cause injury. The Vaccine Court has awarded settlements to vaccine-injured children who exhibit “autism-like symptoms”…whatever that means, bearing in mind that autism is, in fact, diagnosed by a collection of symptoms. 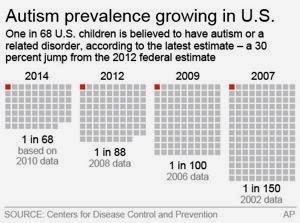 The CDC website reports that in 2007, 1 in 150 children had an autism spectrum disorder; in 2009 the figure was 1 in 110; in 2012 it was 1 in 88; and now in 2014 (using already old data), the number is 1 in 68, representing a 123% increase since 2002. How can the CDC so nonchalantly report these figures without exclamation points? Is this the same CDC that cautions me to get a flu shot or risk death by influenza every year? That releases sketchy research pumping up the dangers of the flu? What perhaps bothered me more than the laissez faire reaction by the CDC was commentary by Michael Rosanoff, Autism Speaks Associate Director for Public Health, Research and Scientific Review. Given Mr. Rosanoff’s reasoning, does this mean New Jersey’s figure of 1 in 45 is the most accurate because they have “better quality records”? I am questioning why a representative of the largest autism advocacy organization would make a statement that suggests the increase is not an increase at all but merely better detection and record keeping. Is he suggesting autism was always present in these numbers, but unknown because of sloppy records and missed diagnoses? I hope not, because autism as experienced by my son, or by the grandson of Autism Speaks’ founders Bob and Suzanne Wright, and indeed by so many children is just not something you miss or pish posh away with “better and more records”. These kids are sick, but I would bet the rent the media and general public will hone in on “better detection and better records” to explain away a national tragedy and keep Americans sleeping at night. Autism is increasing at an alarming rate...does anyone care? So it was business as usual at the CDC and apparently at Autism Speaks. Where is the outrage that we are systematically destroying generations of children in the name of the so-called Greater Good in the form of over-vaccination, fluoridated water, GMOs and environmental destruction through pollution? The CDC reported in 2011 that at that time, 1 in 6 American children had a developmental disability. At this rate that figure will soon be 1 in 1. In honour of Autism Awareness week, I say we take a moment and look at this 1 in 68 figure objectively. First of all, it's based on one study that doesn't boast the most impressive sample size: something in the range of 22 post-mortems if I'm not mistaken. Second, very few are bringing up the possibility of overdiagnosis (here's one that I DID find though - http://www.pressreader.com/bookmark/HBRCHVPQ78V/TextView). All in all, I think it's prime time to not freak out and keep looking at the facts in objectivity. I'm not sure what you mean by post-mortems. The study was based on medical and educational records of children who were 8 years of age in 2010. The DSM-IV was still in effect at that time for diagnosing autism, and in fact was unchanged from 1994 to 2013 when the DSM-V was released. Bringing up overdiagnosis and proving it through rigorous study are two very different things.